Wikimedia CommonsAn computer-enhanced brain scan shows activity in part of the visual cortex. Ever heard someone say you can’t teach an old dog new tricks? New research suggests it may be time to retire that phrase, though the study was small and preliminary. As it turns out, some older people may be able to learn certain things just as well as younger people by harnessing the power of a part of the brain that young, healthy people typically don’t use in the same way. The brain can be thought of as having two major components: grey matter and white matter. We rely on our neuron-rich grey matter for everything from seeing and hearing to processing emotions, exerting self-control, and learning new information. White matter, by contrast, contains all of the brain’s wiring — the complex web of twisting fibres that carry information across different parts of the brain. White matter may also help us learn and could play a critical role in overall cognitive function and intelligence, scientists are now discovering. As we age, our grey matter often shrinks or degrades, making seemingly everyday tasks tougher. But what if the brain had a sort of backup generator, an extra source of power that would fire up when our primary engines were down? It appears that in some older people, the white matter does just that. For the new study, published Nov. 19 in Nature Communications, researchers took a look at 39 healthy volunteers, some young, some older. In the older people with the most flexible white matter, learning a new bit of visual information was just about as easy as it was for younger people who naturally just used their grey matter. The finding seems to contradict a widely accepted notion about ageing: that as we get older, our brains lose their flexibility, making it tough for us to remember things and learn new skills. In some older people, the new study suggests, precisely the opposite happens. In these people, the brain retains the ability to adapt, but in a different brain area than in young people. “As far as visual tasks are concerned, some older people can learn just as well as younger people,” says Brown University neuroscience professor and study coauthor Takeo Watanabe. Nature CommunicationsThe researchers’ scan showing the specific portion of the brain — the white matter underneath the visual cortex — that they studied. To arrive at their findings, researchers had 21 volunteers aged 19 to 32 and 18 volunteers aged 65 to 80 look at screens and push a button when they noticed certain changes in the displayed patterns. The volunteers did the task once before participating in a training session designed to improve their results, and a then a second time afterwards. During the training, volunteers were taught to memorize a letter that appeared on the screen in between the time when the pattern was changed. Memorizing the letter helped them stay focused on the center of the display. That training helped younger and older participants improve their performance on the task equally, and researchers wanted to see if anything in their brains could explain why. 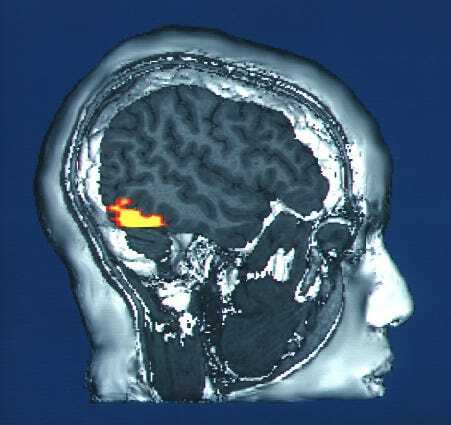 Before and after the task and the training, the researchers scanned the volunteers’ brains. They monitored part of the visual cortex, the grey matter section of the brain responsible for visual learning, to see if it changed. They also looked closely at the white matter beneath it. While younger learners had far more changes in their visual cortex, made up of grey matter, older learners showed more changes in their white matter overall. Based on their results, the older volunteers seem to be in two distinct groups: “good learners” whose accuracy in flagging the pattern change went up by more than 20% after they were trained, and “poor learners,” who improved by less than 20%. The more an older person’s white matter changed, the researchers found, the better he or she learned. While the finding is for now limited to the effects of a very specific kind of visual training in a very small number of people, it provides interesting clues about how older brains might be compensating for — and even cancelling out — some of the grey matter changes that have previously been seen as a marker of cognitive decline.